data records in a free layout table if "Display as link" is active. 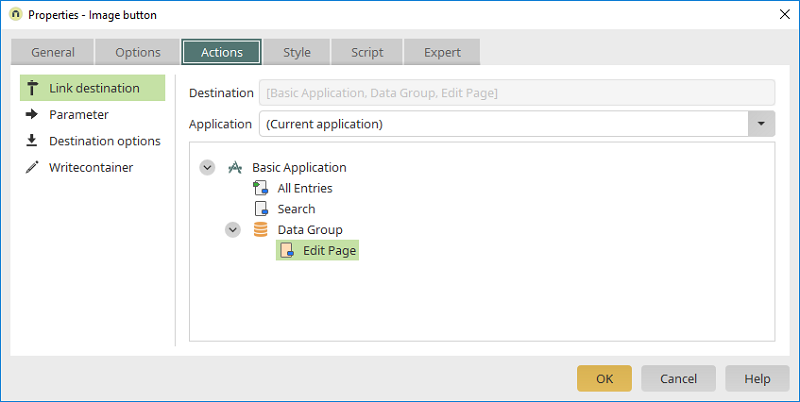 The link destination determines which page will be loaded to display the data record when a user clicks on the button or on a data record in the free layout table in the browser. Activate the setting "Display as link" in the free layout table settings if this is desired. The page that should be loaded is automatically entered into this field when you click on it in the application structure shown beneath. Here, select the application that contains the target page. Click here for more information about the settings in this area. Click here for general information about parameters. Click here for more information about the destination options.